Michelle Genova is Morrison & Company’s Business & Marketing Coordinator. In this role she is responsible for business and office administration including key vendor relations, banking, and office administration. Michelle coordinates Morrison & Company’s marketing, internet, and social media presence, working closely with our creative design and marketing consultants. The latter responsibilities include marketing and branding programs, the Morrison & Company quarterly newsletter, website updates, and social media. Michelle graduated from California State University, Chico in 2013 with BA in Anthropology and a minor in Criminal Justice. Prior to joining Morrison & Company, Michelle worked as an insurance representative in a local office of a national firm, writing policies, assisting clients with claims and compliance issues, and providing assistance with the budget and business planning. She combined her education in law and an interest in flood insurance to research flood maps, federal regulations, and flood plain management to assist farmers struggling with mandatory flood insurance requirements. Her passion to support growing businesses helped her develop the necessary skills to excel in her capacity as a B2B coordinator at Morrison. 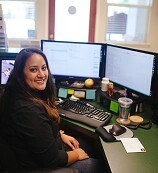 Originally from the Yuba Foothills area, Michelle came to Chico as a student. After graduating, she spent a short period of time living in Rome where she taught English as an au pair.